In the depths of a blustery autumn with another British winter on the horizon you can cheer yourself with thoughts of summer and the joys of open top motoring that await. 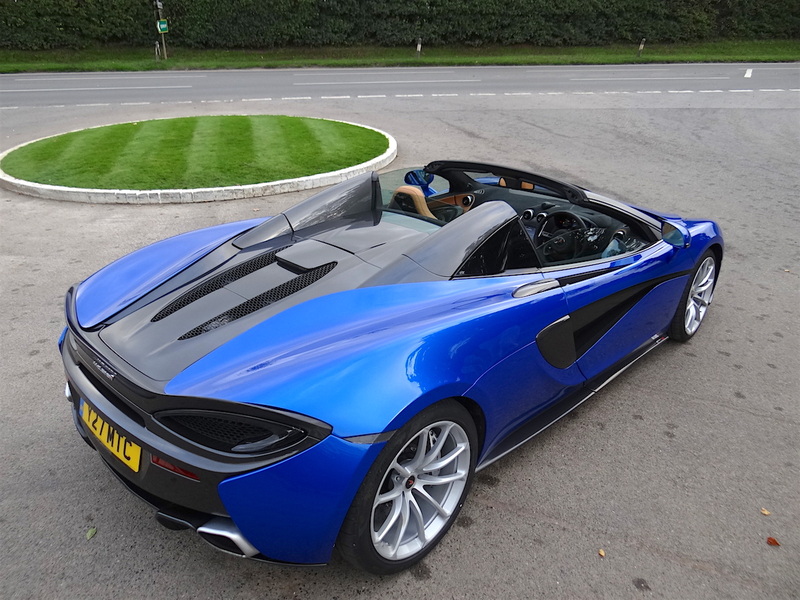 If that dream also includes achieving this wind in the hair experience at close on 200 miles an hour and you have almost £200,000 burning a hole in your bank account then McLaren can fulfil your fantasy with their new two-seat 570S Spider. Despite its on-the-road starting price of £164,750 (note the numerical symmetry here) this latest carbon fibre concoction is now the entry level convertible in the McLaren road-car line-up sitting proudly on top of the Sport Series, joining the Coupé and the GT and carrying just a £15,000 premium for the added bonus of open-top motoring. Sharing the stunning curvaceous lines of its siblings, the Spider uses the same 3.8 litre twin-turbo V8 M838TE engine (developing 570 PS – hence the model designation) and despite adding 46 kg (101 lb) to the overall weight it still clocks up an identical 3.2 seconds to reach 62 mph – it’s only with the roof down that the speed dissipates and the sprint time is a laggardly 3.4 seconds. Top speed again matches the Coupé at an eye-watering, brain-concentrating, 204 mph until you lower the roof when it shaves off 8 mph from the maximum, not that anyone is going to notice. The integrated two-piece composite retractable hardtop (which comes in body colour or contrasting Dark Palladium costing an extra £2,190) slightly changes the overall profile of the 570S compared with the Coupé (the rear spoiler is also 12 mm or about half an inch taller) then neatly tucks away behind its own tonneau cover that rises and falls at the touch of a button. At 15 seconds to raise or lower it is one of the quickest around and this can be achieved at speeds up to 25 mph – it’s certainly a head-turner when you do this in town. 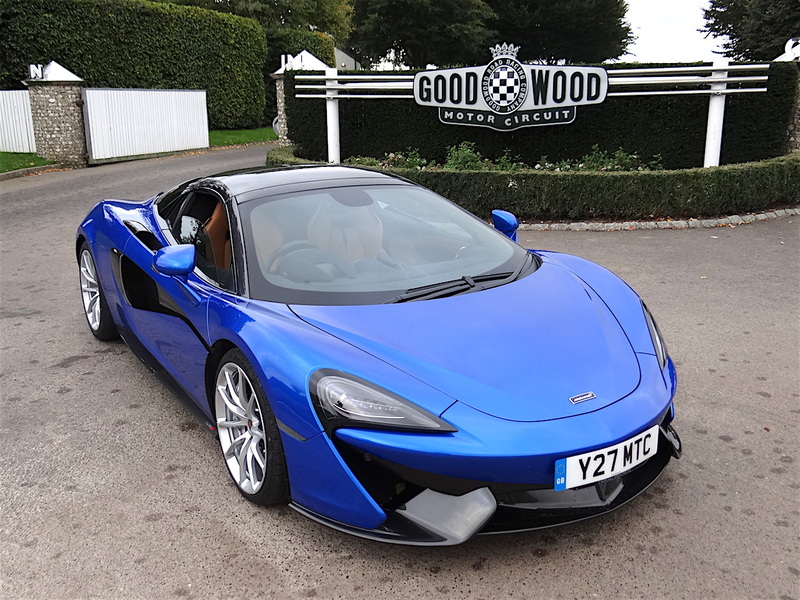 McLaren also fits a glazed wind deflector which can be electrically raised or lowered at the push of a button, either with or without the roof in place. The low seating positon of the cabin means that the top rail of the windscreen manages air flow over the heads of occupants while the deflector effectively stops wind whipping in around the neck. However, you are probably going to want to lower the deflector for much of the time just to get an added shot of the sound from the purring V8 which is nestling just a few inches behind your head. Truth to tell I was slightly disappointed by the noise (even with the optional £3,370 sports exhaust. I had anticipated a crisp, high-pitched bark but on the 570S it is slightly muted and more of a low rumble). This doesn’t disturb the quiet serenity of the cabin which, in this case, was fitted with a designer luxury pack (£2,570) consisting of various panels in black and tan leather along with acres of soft-touch Alcantara. To this is added various carbon fibre elements (another £5,510). With the added luxury pack (£7,280) of eight-way multi adjustable electric seats (including lumbar support), power adjustable steering column, soft close doors and high end Bowers and Wilkins 12 speaker audio, the Spider is no Spartan when it comes to accommodation. 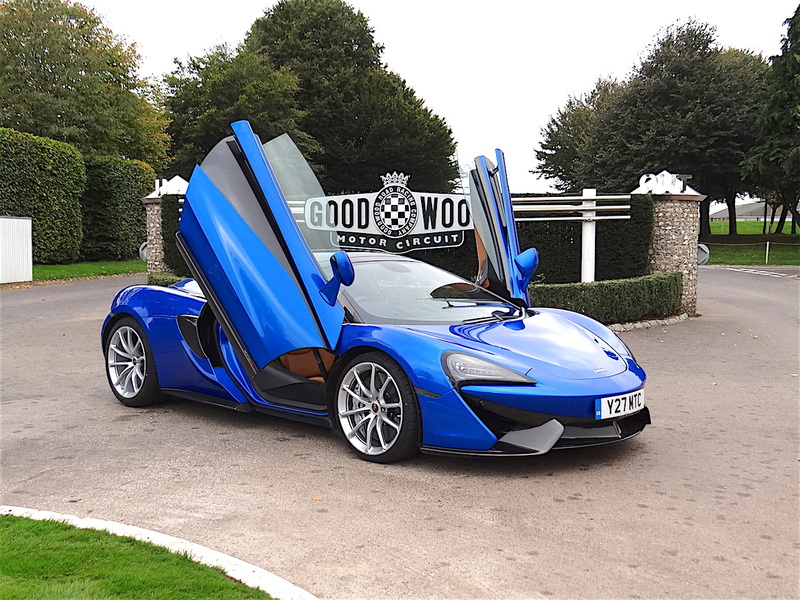 From this comfortable and commanding position the driver is in charge of a high-tech chameleon, a car that will dawdle around town all day – unlike many supercars the McLaren doesn’t push you to let it loose, it is happy just to go at walking pace. But, when you press the loud pedal, flip the paddle shifts it turns into a 419 PS per tonne monster, chewing up the tarmac likes its life depended on it. 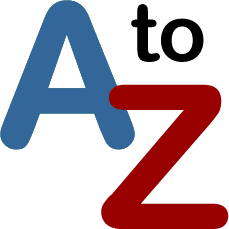 Heads snap back as the acceleration kicks in even when in full automatic mode and very soon you have experienced all seven gears. Using the paddle shifts adds a more brutal punch to the experience either accelerating or decelerating. And when it comes to reining in that horse power, the 570S is home to big beefy carbon-ceramic disc and aluminium caliper brakes; the only odd feel is the slight delay in depressing the brake pedal and response which is down to the brake-by-wire electronics. To give the 570S a neutral handing sensation the system also features brake steer which applies a slight amount of braking to the inside wheel as you turn into a corner, helping to reduce any hint of understeer that could be induced by the rear-wheel drive pushing you on in high speed corners. Having all this fun does have its penalty when it comes to fuel consumption. McLaren claim over 25 mpg should be possible on a typical drive, but then nothing in the 570S Spider is typical so the 19.8 mpg I registered is probably more representative. For me you can forget the bare performance statistics of the 570S; what makes it so special, like every other McLaren that I have driven, is the way it rides and handles. The all-round double-wishbone independent suspension is allied to steel springs, but it is the twin-valve adaptive dampers and anti-roll bars that really do the job of giving the breed its enviable ride quality that means that even with the low profile 19 inch front and 20 inch rear wheels and tyres you hardly notice Britain’s road imperfections. When combined with the stiff carbon-fibre MonoCell chassis, light-weight aluminium body panel construction and near-perfect weight balance of the mid-engine layout, the 570S feels as if it is floating rather than riding on the road surface but it never becomes disconnected. 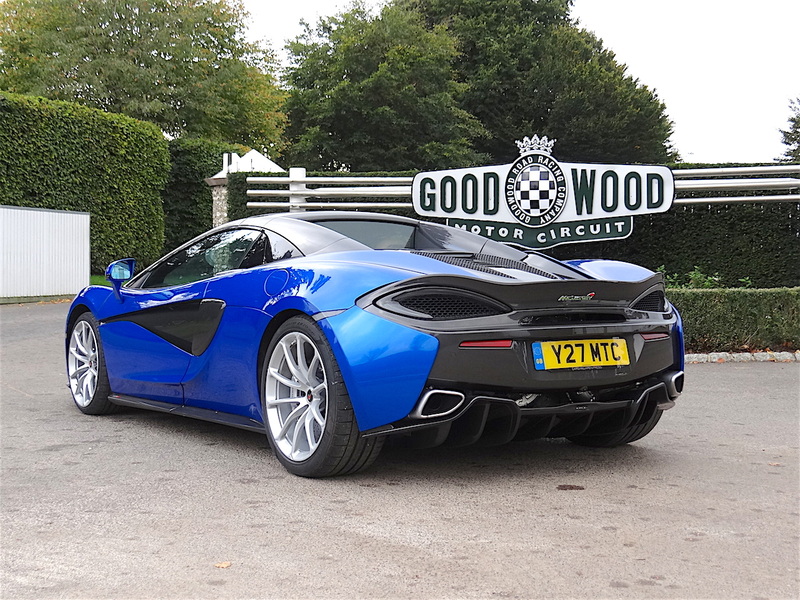 McLaren has installed an active button that varies the suspension from normal through sport and onto a track setting which gradually firms up the ride, but between normal and sport the difference is minimal until you start pressing hard through corners, when the 570S hangs on like a tenacious leech. Several of my colleagues have complained that the McLaren’s hydraulically assisted power steering is a little sensitive but, for me, that is part of the joy of the drive. It goes exactly where you point it a millisecond after you turn the wheel to the wider front track, which means that you always need to keep a firm hand on the steering wheel – this is all part of the McLaren driving experience and you wouldn’t want it any other way. Given the ability to afford a hand-assembled McLaren I would opt for the Spider in a heart beat. It does everything the Coupé can, with the added bonus of the option to flip its lid and that’s probably why McLaren anticipates it will account for 50 per cent of all worldwide Sport series sales – that’s 1,250 units which will make it the most popular model in the entire McLaren range. 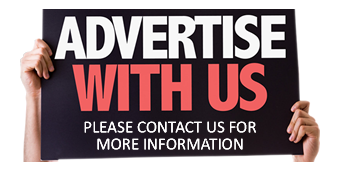 However, don’t expect to see many on UK roads as less than 10 per cent of their Woking production line ends up staying in the UK – that’s unless more domestic motorists can fulfil their dreams.